During the last two weeks leading up to Giovanni’s arrival I was so miserable! I was HUGE. I know every pregnant woman says that but after having several people who were so kind enough to actually tell me just how BIG I was, there really was no denying it. My poor husband had to listen to my endless complaining about how tired and uncomfortable I was day after day, night after night. And nights were the worst. I tossed and turned for 10-15 minutes before finally finding a comfortable position and then I’d have the sudden urge to use the bathroom. Every night! It’s funny now to look back and remember it, but in those moments I was just completely miserable. The morning I went into labor was a typical day for me. Isabella and I dropped Anthony off at school and came home to have a yummy breakfast. We even took a small walk around the corner to watch kids walk to the nearby school (her favorite thing to do every morning!). Once we were back home, I started the never ending task of cleaning the house while contractions came and went, irregularly, as usual. 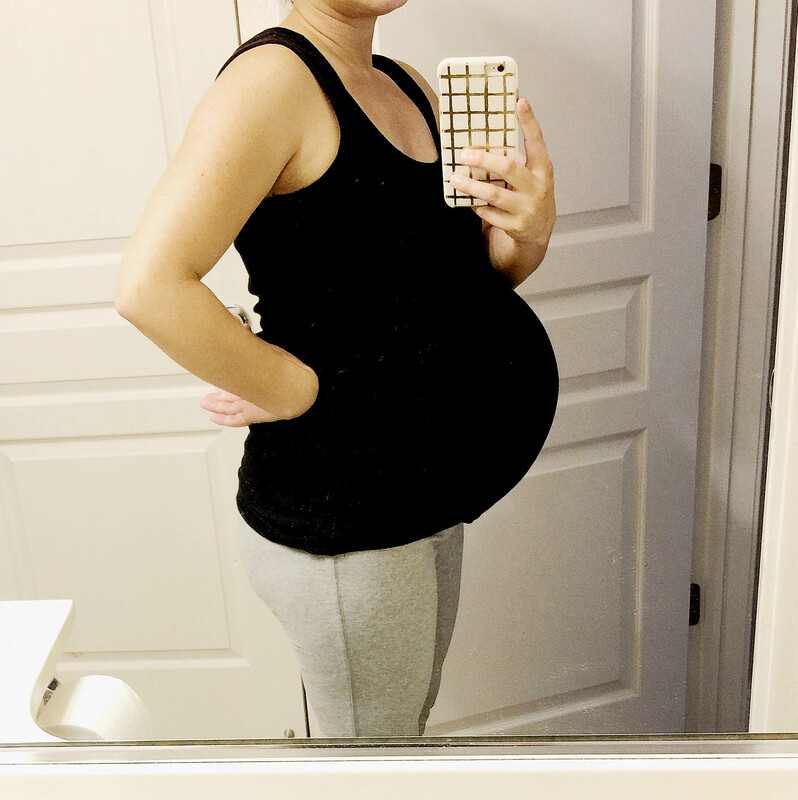 As I cleaned the bathroom and stared at my huge belly in the mirror, I decided I should take a bump-selfie. A “bumpie”. I’m so glad I did this – I kept envisioning that my water would break as it did with my previous two pregnancies and I’d have time to get ready, make it to the hospital and take a picture smiling in my room with my hubby before I changed into the oversized and unappealing hospital gown. Within 15 minutes of this photo I had my “bloody show”. My contractions were still irregular but the strength of them told me it might finally be time to meet my little guy. I decided to take a quick shower and by the time I got out my contractions were already at 5 minutes apart. It came so quick. This was not the first time I had experienced contractions so close together so I was a little hesitant to call my husband home from work. Finally after 30 minutes of semi-painful contractions I sent him the text. I foolishly told him not to leave just yet, I’d wait a little longer. I’m so glad he didn’t listen. He was about an hour away and by the time he arrived I was in so much pain… We still had a 30 minute drive to the hospital and a hungry toddler to feed! As my husband quickly made my daughter lunch, I put on a little makeup in between contractions. Yes, thats right. I put on makeup! I had booked Emily Shores Photography to capture Giovanni’s birth and I was determined to look somewhat decent in the photos. Seems silly but I’m really glad I was able to do a quick 10 minute makeup application. Once my sister arrived we said our goodbyes to Isabella and were on our way. Contractions were staying steady at every three to four minutes and were becoming even more painful. I was literally in tears every four minutes. In tears and also a little hungry! I was starting to realize that once we got to the hospital there was no chance of getting something to eat and I had no idea how long labor would last. As we got off our exit I told my husband to stop for a milk shake and fries. Who does that? A pregnant woman! By the time we got to the hospital the pain was so bad that my husband had to push me in a wheel chair (as I finished off my fries with tears coming down my face). That must of been a funny sight – too bad we didn’t get any photos of that! The first thing I told my nurse was that I needed an epidural and I needed it now. Too bad for formalities. She advised me I first needed to be admitted and have my vitals checked, etc. Once we went through the admission process and they checked my vitals, contractions, etc., the nurse moved me to the birthing room pretty quickly. The contractions were so painful, I was no longer able to talk through them. I was begging and pleading for the epidural. Unfortunately my blood pressure was spiked and they needed to take blood. 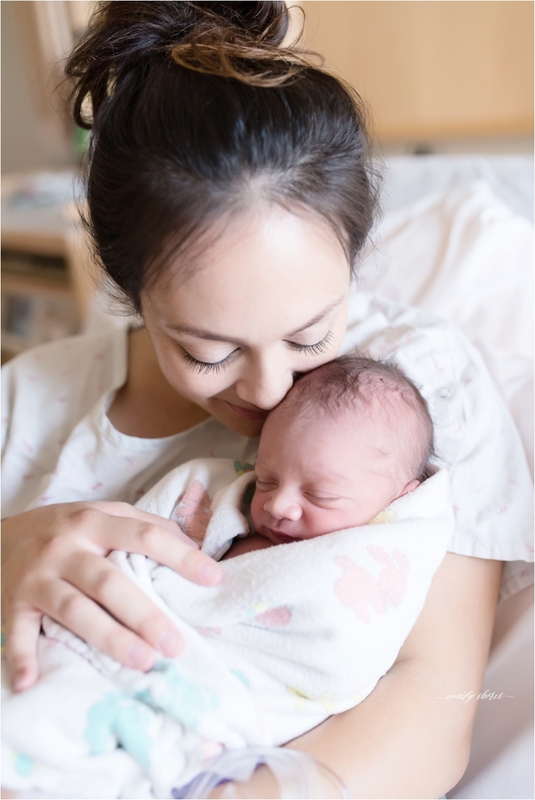 The doctor was concerned it was the onset of preeclampsia and said that I could not get the epidural until they got a negative reading – or until my blood pressure returned to normal. I asked why. Never ask why. They said it could cause a seizure, blah blah blah. Not really blah blah blah but after hearing seizure I kind of stopped listening and my mind began racing with thoughts of my kids and this baby. Luckily my blood pressure ended up lowering to a safe number and they finally called for my epidural. I had never been so excited to see a doctor in my life as I was to see the anesthesiologist. As he began prepping my epidural I was finally beginning to feel some relief. I was done with contractions!!! Twenty minutes after getting my epidural I was still in so much pain! My left foot was pretty numb and my right foot was partially numb but I still felt every contraction. Every. Single. Painful. Contraction. Again I was begging for the nurse to call the anesthesiologist back in. It felt like hours had passed (in reality it was probably only 15 minutes before he came back). He adjusted the placement and tried giving me more medicine through the epidural. At one point, he said he had given me enough medicine for four people and just couldn’t give me anymore. I was so terrified at the thought of feeling everything. I wasn’t prepared for that. I never took lamaze class or anything close to it. Everything happened so fast after that. My water broke during a painful contraction and then magically my epidural seemed to finally kick in!! Within minutes I finally met my baby boy! As you can see it was love at first sight! For the kids too… shortly after Gio’s birth, my mom brought the kids to meet their baby brother and they were in awe of him. I’m so lucky to have had the opportunity to hire a photographer to capture all of these moments for us! 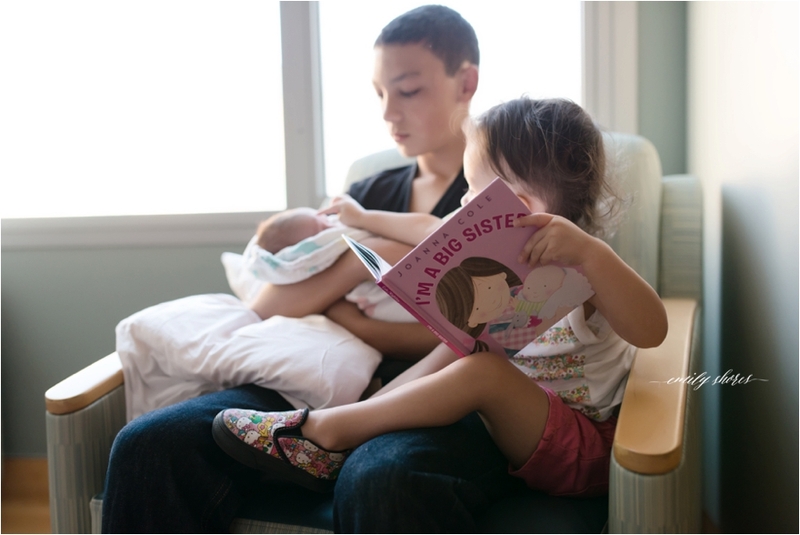 Even luckier that our photographer turned our birth story into a short slideshow/video. If you’d like to take a look, I’ve included the video below. Be prepared, I’ve had many people tell me they were brought to tears watching it. Hello Giovanni from emily shores on Vimeo. As crazy at it sounds, all three of my births have been completely different experiences. If you have had multiples, how did your births compare to one another? Congratulations! I love reading birth stories. I'm so glad your epidural finally kicked in. Enjoy your precious bundle! THESE PICTURES ARE SO STUNNING! What an amazing moment! & happy birthday little man! I LOVE all the pictures, what special memories to have! Thank you! The investment was definitely worth all the lovely photos! So beautiful! I wish I could live Adalynn's birthing day over and over and over again. These pictures and videos are just perfect – what a special keepsake to have! And you look just gorgeous! Happy 1st birthday Gio!!!! The slideshow and photos are amazing! If we're blessed with one more I hope to have a professional photographer there as well! Loved reading your story! You won't regret it! Thank you so much! Now I wish I had gotten a photographer for my babies' births! Love love love them! !